KUALA LUMPUR (May 13): Standard Chartered Global Research (StanChart) said while it expects further ringgit weakness in the coming months, the extent of the move would be relatively modest and largely led by a broader US dollar move. 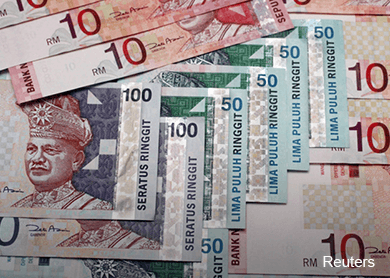 It said the performance of the ringgit was driven by two factors, namely a reduction of short ringgit positioning and a gradual move higher in global crude oil prices. In a note today, StanChart said Malaysia’s gross domestic product (GDP) growth likely remained resilient led by the domestic sector, while private consumption prior to goods and services tax implementation in April was likely to continue to drive growth. It said Malaysia was due to release its first quarter 2015 (1Q15) gross domestic product growth data on May 15 and forecast 1Q15 GDP growth of 5.4% year-on-year (y-o-y); this implies that growth slowed to 0.4% quarter-on-quarter on a seasonally adjusted basis from 2% in Q4-2014. It also expects private consumption to ease in the coming quarters given front-loaded purchases. StanChart said investment, particularly in ongoing public infrastructure projects, was likely the other key growth driver. External demand, however, is weak, although the fall in imports likely boosted the net trade contribution to growth, it added. It said that monthly indicators already released show that growth remained resilient, noting that industrial production increased 6.3% y-o-y on average in Q1, from 5.8% in Q4-2014, supported by resilient mining production, which rose 8.9% y-o-y on average. But external demand looked weaker than domestic demand, as exports fell 2.7% y-o-y on average in Q1, from 0.5% in Q4-2014, dragged down by sluggish demand from Asia, it added. StanChart said that nevertheless, Malaysia was one of the few Asian economies that did not suffer from a strong rise in its real effective exchange rate, which should be less detrimental for export growth ahead, pointing out that Malaysia’s trade surplus was stable at RM7.1 billion in Q1, roughly unchanged from Q4-2014, which implies that the current account surplus will remain supported. "We forecast a current account surplus of 2.5% of GDP in 2015, after 2.2% in Q4-2014,” it said. StanChart cautioned of a slight risk of policy easing by Bank Negara Malaysia (BNM) if growth slows further. “Our end-2Q15 US dollar-ringgit forecast is 3.75,” it said. StanChart also said that its data suggested that real-money investors were still underweight Malaysian Government Securities (MGS), likely supporting these securities. Moreover, it believes that BNM’s current neutral policy stance is positive for foreign exchange and should underpin foreign demand for MGS. StanChart recommends buying 5Y MGS (current: 3.60%, target: 3.45%, stop-loss: 3.75%, entry: 3.65%).